This week I lost my service dog, Samwise, after over 13 years together. I do not believe that there is anything like the loss of a service dog who was also such a great person. If you take into account the fact that he was with me 24/7, we shared more hours together than people do in most marriages. A black mouth cur, he was fearless, intensely loyal, independent minded, and a brave protector of puppies at the dog park. I have stumbled trying to find words to describe the experience of losing a service dog after so many years. There is now a silence, an emptiness. But the word that better describes this for me is “echo.” There was once someone in my home that was solid and strong. But now when life enters my home it does not sink into his comforting, protective presence. Instead it travels around, hits the wall, and echoes backward. Why was Samwise, in fact, the best dog in the universe? This is the unhappiest picture of Samwise that I have. He was being a good sport. 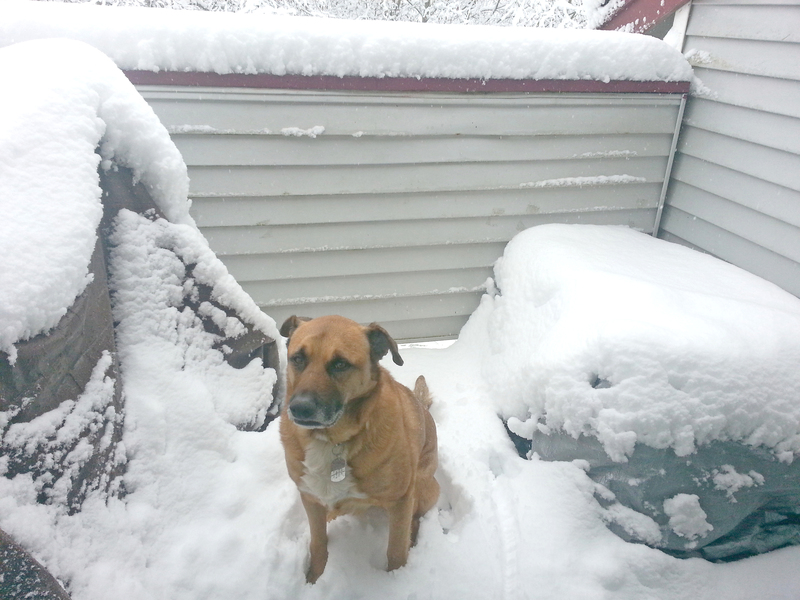 He did NOT want to sit on the frigid snow, even if it was a useful gauge to show how much snow had fallen overnight. I didn’t do this again. But he was being an excellent dog. In the last six months of his life, knowing that we were on borrowed time, I invented a third phrase, “best dog in the universe!”The first few times I used that phrase he looked at me, uncertain as to what it meant and whether or not I really meant it. Of course I meant it and it was absolutely true. We didn’t need to get into a philosophical discussion about the fact that every dog is the best dog in the universe. Day 1. Utterly fearless, with a red ribbon from the puppy rescue. This is the second large dog that I have had for more than 13 years. 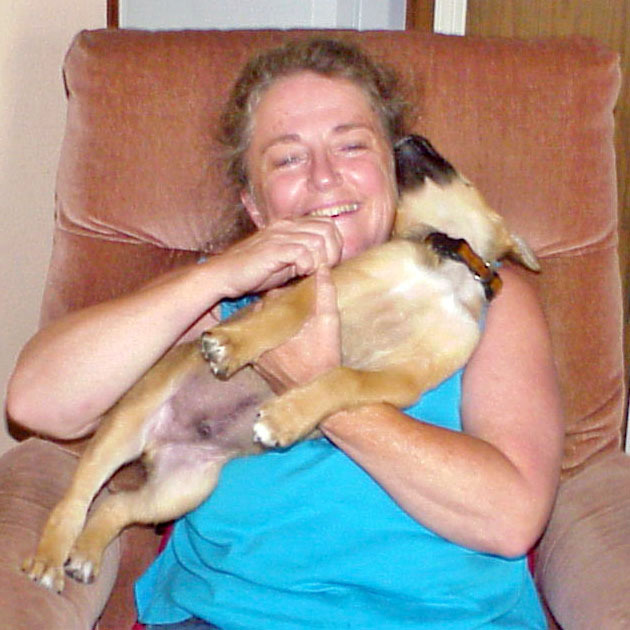 The first was a beautiful, timid, super smart, shepherd-labrador-spaniel who had been weaned much too early, at 5 weeks. Following the example of my dog savvy friend, I got Samwise a year or so before she died . At first I thought it was denial of grief to do such a thing. But now I know that to do so is beneficial for both dogs. He invigorated her last few days, even if he did that by driving her more than slightly crazy with his puppy antics. And she showed him the ropes, calmed him down, and acted as a surrogate mother for him. He brought much needed joy in my life when I was going through a 3 year clinical depression. I happened by accident upon this breed of dog. I had never heard of a black mouth cur and had only heard the word “cur” used as a pejorative. Then I discovered that all that it meant was a hunting dog, usually in the southeast of the United States. Now I think of it as the Swiss Army knife of a dog, excellent at many things, with multiple talents. A skilled hunter, protector, herder, companion dog, etc. “Old Yeller” is a well-loved children’s book about a stray black mouth cur. He protected the family against a rabid wolf at the expense of his own life. The story describes some of the breed’s traits worth treasuring — selfless and fearless. 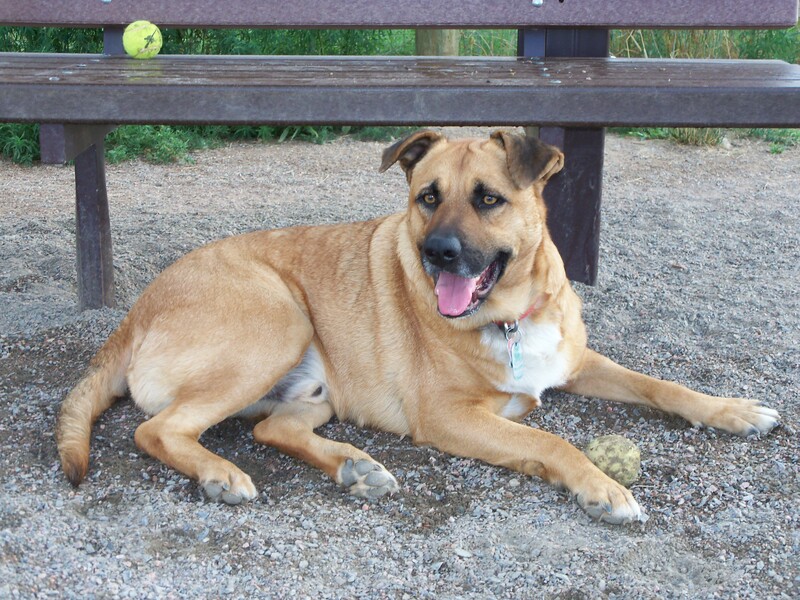 The movie “Old Yeller” used a Disney version of the dog, a much larger (170 pound) Labrador Retriever/Mastiff cross. My opinion is that a real black mouth cur is too smart, too practical to have made it through the casting call, They would have been bored by acting, a superfluous job, in their reckoning. If I had known anything about the breed I would not have adopted him. At that time I didn’t understand how valuable the breed’s traits are or know what it is like to be protected by such a dog. 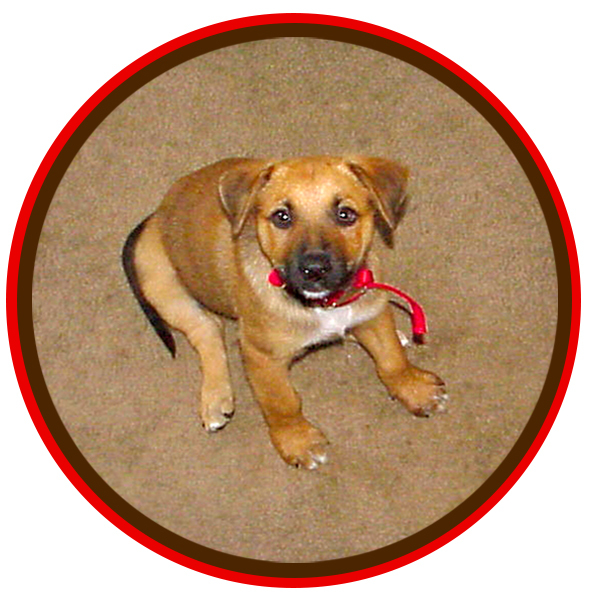 Instead, the puppy rescue told me that he was a shepherd-labrador, which is what I wanted. Since then I have learned is that “lab-shepherd” is a generic label that shelters and vets use when they’re not certain of the genetic makeup of similarly looking large dogs. 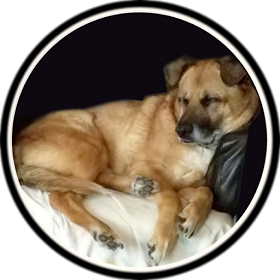 It took me almost 12 years living with Samwise before I tried out an android app, Dog Scanner, that allowed me to upload several of his pictures and get an estimate of genetic heritage. From what I had heard (from people at dog parks who went to the expense of genetic testing), interpreting results from this and similar apps judiciously was at least as reliable and probably as valid as those test results. Not very accurate! Genetic testing for dogs is a money-maker and unreliable — results vary widely depending on who does the genetic testing. But! The fun and useful news is that, if you know your dog and interpret the results scientifically, you can figure things out that help you better live with and understerand your dog. When I looked at the results for each of the photographs and the suggested percentages for different breeds, I saw that black mouth cur was 30-80% of the suggested overall percentages. 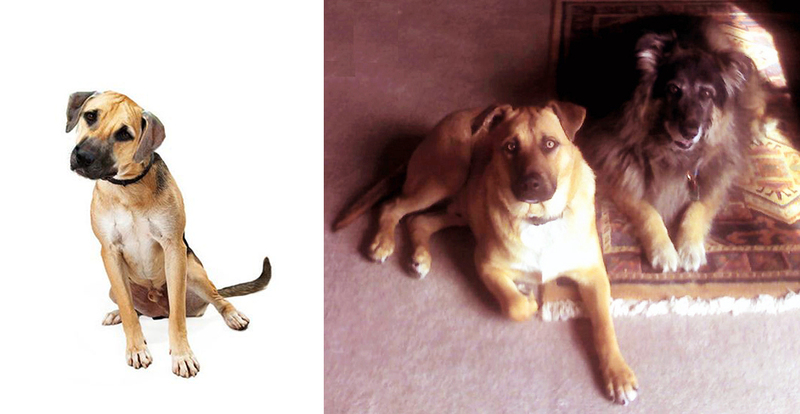 Left: Black mouth cur breed. Right: Samwise with adopted mother. 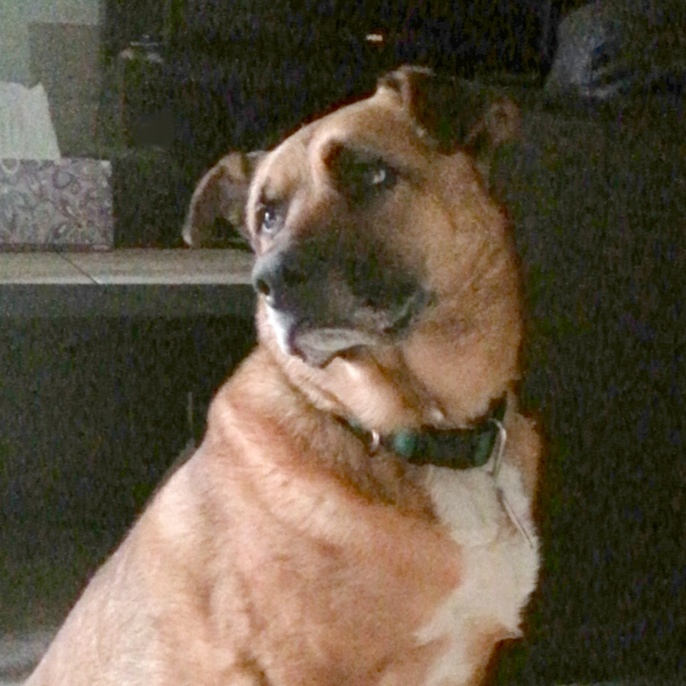 After I compared purebred photos from the internet to photos throughout Samwise’s life, it appeared that it is quite possible that he is a purebred black mouth cur, or slightly diluted. Although this breed makes the idea of “purebred” look pale. They are a practical breed, no froufrou. At first I was confused, because black mouth curs were typically bred for farmwork in the southeast. But he was rescued from a farm in the midwest. When I went to look at the distinguishing characteristics of the black mouth cur breed, I saw how everything not only applied to Samwise but helped to explain some of his behaviors. In particular the very first characteristic was “fearless,” which was the first word that I used to describe him. That realization was a small grimace for me because I realized that I, as a responsible dog’s human, needed to teach him to fear a few necessary things — cars immediately came to mind. This picture is from the first day he came to me, 8 weeks old, from the puppy rescue. Black mouth curs are also strong minded, which in my experience means that they very good at recognizing for themselves what is important. Samwise’s independent mindedness could be aggravating but I respected it. He needed to be certain, for his own well-being, that he had used his best judgment in making decisions that affected my safety. Whenever I registered an opinion he only took those under advisement. It was his responsibility to keep us safe and he took that responsibility very seriously. 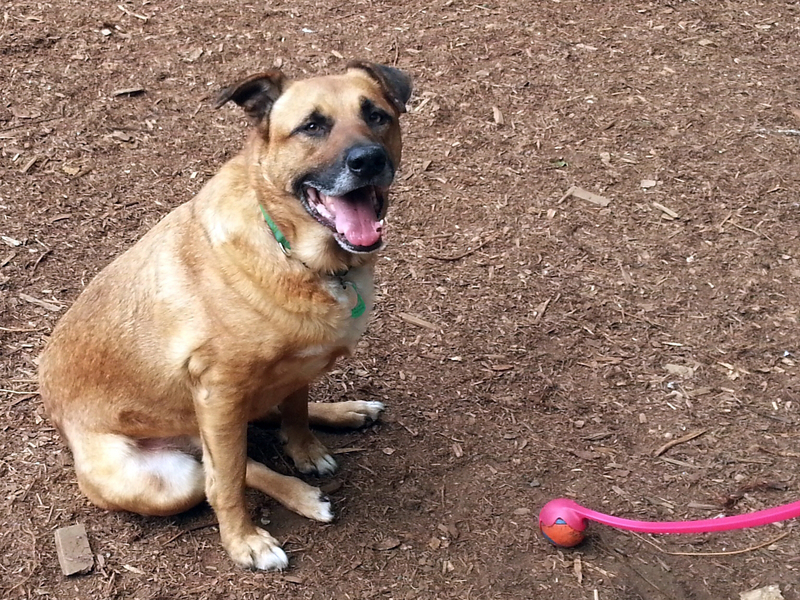 At dog parks Samwise protected me, puppies, and the adolescent males which were always his self-chosen responsibility. Size or breed never intimidated him — I never saw him afraid of any dog. He protected the puppies by simply putting his body between them and the offender, turning, and looking at the potential offender straight in the eye. They never argued with him. They always decided to play elsewhere. Adolescent male dogs, 9-24 months old, simply adored Samwise. He exuded some sort of Fonz-like confidence. They would come over to acknowledge his coolness and learn from him. Because we spent over an hour every day at a wonderful dog park, he had many friends and developed great canine social skills and intelligence. The young dogs respected him instinctively and particularly enjoyed playing with a dog that knew when and when not to set boundaries. I never understood that completely, but dogs need to know the rules more than we do and relax when they are around a dog who sets clear boundaries. The other humans at the dog park nicknamed him “Sergeant Samwise.” I was repeatedly assured that no dog was ever hurt in these corrections, and that in fact they were grateful that their dog benefited from being straightened out by the Sergeant. Once or twice a month some ignorant dog, usually a dog unfamiliar with dog parks, would do his/her damnedest to cause problems. But after Samwise established the standards for correct dog behavior all of the other dogs relaxed, the idiot dog learned something, and they were all having fun again. His self-chosen job didn’t look like fun to me, but he was born to it and did it exceedingly well. His more severe corrections of major dog infractions frightened me at first. They were noisy, usually involved some form of wrestling, and it looked like a dog could get hurt. But those more serious admonitions happened rarely and apparently only when it was appropriate. I learned to distinguish these loud discipline sessions, which appeared aggressive but instead meant, “No! And don’t make me tell you again!” If a corrected dog didn’t appreciate it, when they saw the other dogs’ response they soon learned that they had deserved it and could benefit from it. This week I grieved. At first it felt impossibly hard. It was the first time in my life that I recognized that humans, as animals, grieve as animals do, at least in part. Our bodies physically grieve. It is not just our emotions expressing themselves through the body. Our bodies mourn the contact, the smell, the physical presence of the loved one. The first day it was all that I could do to find blankets that smelled of him and lay within them on the floor of the living room and sob. Then I started to gather everything that reminded me of him and put it all into one place. Not to get rid of him, but to pull all reminders of him out of my small surroundings. That helped, because then I wasn’t being constantly triggered. I needed to begin to become accustomed to living in my space without him. This time I am taking time to grieve Samwise before moving on to another dog. This time I’m not sure I can move onto another dog. Queen Elizabeth and I are in similar company. I too do not know if I can handle losing such a precious animal again. I too do not want to have a lesser dog, especially if I am only able to hope or expect them to be like him. Farewell, Samwise. May you chase those celestial squirrels and rabbits along the starry trails in the canine nighttime skies.